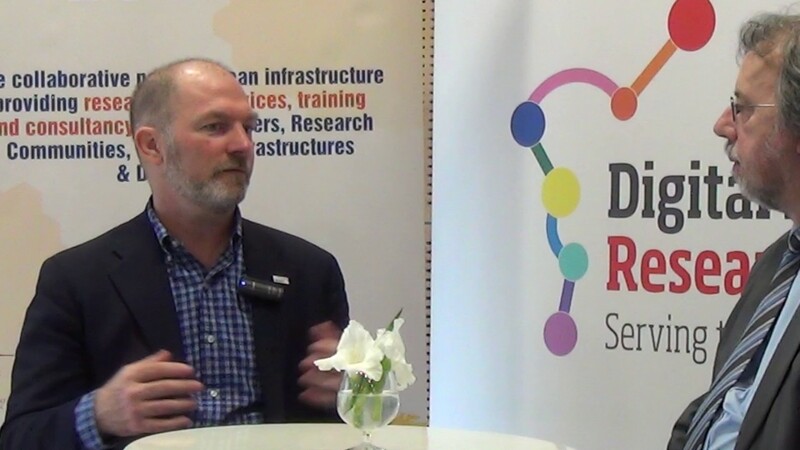 At the occasion of the Digital Infrastructures for Research (DI4R) Conference, held in Krakow, Poland in the Fall of 2016, we were able to speak with Steve Cotter, the new CEO of GEANT, the pan-European network for scientific excellence, research, education and innovation. GEANT connects about 10.000 institutions across 41 different countries. GEANT provides the backbone infrastructure that connects all the different national networks, not only to themselves, but also to its international collaborators abroad, to over 100 other research and education networks around the world. We asked whether GEANT is the link between European researchers and all the other researchers in the world. Steve Cotter confirmed this. The network is specifically designed for the needs of big science. Whereas commercial networks architect their networks to handle billions of small flows such as e-mails and YouTube videos, GEANT is architected to handle the very large flows that emerge from places like CERN, the Large Hadron Collider where one is generating multiple Terabytes of data per year and sharing that with thousands of researchers around the world. Another example is the Square Kilometre Array (SKA) which is going to take things to a whole new level. There is also something like services. If attendants of the meeting in Krakow have an eduroam account, they can log in as if they were at home. Is this one of GEANT's services, we wanted to know. Indeed, eduroam is one of GEANT's real success stories, Steve Cotter explained. Eduroam is now in close to 80 countries worldwide. It is spread beyond just Europe and North America. It is available in Asia, Australasia and even Africa. It is widely used. There were over 1 billion log-ins by May 2016, just for the year and it is continuing to get widespread adoption. It is one of those services that just works. That is the key to its success. It is a service that has been built on top of the network. While GEANT provides the networking infrastructure that connects scientists and researchers to one-of-a-kind scientific instruments or students to knowledge repositories, the GEANT team recognized that it is more than just about connectivity. You have got to have the services on top of this that help enable the collaboration and the knowledge transfer. GEANT provides services like single sign-on for giving in your e-mail account for accessing wikis or other knowledge repositories. GEANT also provides access to Cloud services under unique framework partnership agreements so that researchers get the type of Cloud service that is more tailored to their specific needs. There is a whole bunch of areas where GEANT is involved in that use the network, not just the actual connectivity itself. If you take the Cloud services, for instance, it is not like GEANT is providing the services itself but it is providing the interface, isn't it, we asked. That is correct, Steve Cotter affirmed. What GEANT is trying to provide, are the framework partnership agreements so that a researcher in Krakow can get access not only to Amazon but can get it at price points that are taking advantage of the good buying power that GEANT can get through its 15 million users. GEANT has also direct connections into the Amazon data centre so that the experience that the researcher has of using that Cloud service is optimal. The reality is that there is no Cloud but there is a network. The experience of using the Cloud services heavily depends on the performance of the network. What GEANT tries to do is providing the kind of high performance activity all the way from the Amazon data centre for example to the campus and the researcher's desk, working with the partners at the national research and education networks (NRENs), the campuses, and everywhere in between. It is all about facilitating the access to the Cloud facilities. GEANT doesn't want its own Cloud infrastructure. GEANT would not be able to scale to meet the needs of the community in a very cost-effective way. GEANT leaves that to the industry which can do this much better than GEANT can. For certain types of data infrastructure, the researchers need something that is different from what the industry can offer. For instance, EUDAT offers that kind of services. Is GEANT collaborating with those partners, we asked. Absolutely, Steve Cotter answered. One of the things where GEANT spends a lot of time and effort on is making sure that the end users are able to get access to the services in a way that is as less restrictive as possible. The challenge is that a researcher who has a dataset that needs to be moved to a supercomputer needs to talk to a bunch of different organisations. The more GEANT can work together with EUDAT, PRACE, EGI, and others the more seamless that experience will be. That is something really important that GEANT has to offer to the community. The conference in Krakow brings together EUDAT for data, GEANT for networking, the Research Data Alliance, EGI for computing, etc. What are the type of things that you are collaborating on these days, we wanted to know. Steve Cotter said that they are collaborating on a bunch of levels. One is service delivery: how do we make this experience as seamless as possible? But the organisations also spend of lot of time making sure that they deliver the type of training that people need in order to use the services, so they understand what sort of questions they need to ask, so that we are speaking the same language. We need to make sure that they know how to best use the services. Between the e-Infrastructures we are working on how we can market the services in a coordinated way. We do not want to be viewed as working in silos and competing with one another. We are actually working in a very collaborative way and we have to make sure that we are presenting that to the community as an entire service portfolio, Steve Cotter explained. We were also curious about how GEANT is financed. GEANT is fifty percent funded through the European Commission for running the backbone network but it also gets fifty percent of its funding from the nation states. The different NRENs that connect, pay an annual subscription fee. It is one of the success stories of the collaboration across Europe and providing infrastructure. It is funded in a way that we are all sharing the burden of the cost. The money that you get through the European Commission is public money and they want to know whether this is well spent. Lately, they put a lot of emphasis on Key Performance Indicators (KPIs), how is GEANT working with these KPIs, we asked. The way GEANT is working with the European Commission is that GEANT develops a project plan within the framework partnership agreement where GEANT sets out the KPIs and the milestones that it will achieve within the current 32-month project period. GEANT works with the community as well as the Commission to agree to a set of KPIs and it executes on that over the course of the 32 months. After that, the Commission performs a review and measures us against we said we would do versus what we actually delivered, Steve Cotter explained. This is the way GEANT develops and uses KPIs. One of the things the e-Infrastructure Reflection Group (e-IRG) for example is also looking at is how you can compare KPIs, not necessarily how you can compare networking with computing, but how you can understand what a KPI from GEANT means if you compare it with a KPI from, for instance, EGI. There is a kind of framework being developed for that. Is GEANT also participating in that framework development, we wanted to know. It is a challenging thing to do, according to Steve Cotter. How do we show a clear and direct correlation to what we deliver and a scientific outcome? This is a bit challenging. You can say that networks are not going to find a cure for cancer but conversely, you could say that a scientist is going to have a difficult time finding a cure for cancer without a network. GEANT is working with its other partners in the e-Infrastructure space to try and figure out how they can measure outcomes. What is it that they want to help the community achieve and is the community achieving that? If so, then the partners are probably on the right track but GEANT very often asks its end users for feedback on their satisfaction of the services that it provides and GEANT also works with its funders and partners as well. GEANT is constantly taking feedback, always looking for a continuous improvement that it can make. GEANT is one of the co-organizers of the DI4R Conference. Will there be a next conference, we asked. Steve Cotter certainly hoped so. That is the plan. The organizers had more attendees than they thought they would for this first one. There were over 300 participants. This shows the interest in this sort of event where people can talk to all the infrastructures all in one place. There is a lot of value in that and people recognize it. That is why they had as many people show up this time and Steve Cotter was quite certain that the partners will continue this in the years to come.